A two-step assay using three different functional nanoparticles (NPs) has been developed for the selective and sensitive detection of human immunoglobulin G (hIgG). The first step involves the interactions of hIgG with protein G (PG)-functional γ-Fe2O3 magnetic NPs (denoted as FMNPs) and PG-and-aptamer-functional gold NPs (denoted as FAuNPs, 13 nm) via specific PG–hIgG–PG binding, followed by the magnetic separation of their complexes (FMNPs–hIgG–FAuNPs). In the second step, the concentration of free FAuNPs is determined by exploiting their inhibition of thrombin activity toward fibrinogen-modified AuNPs (Fib–AuNPs, 56 nm). 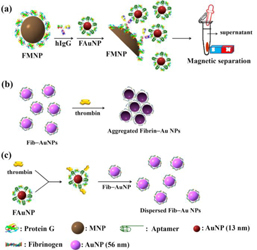 Quantitative analysis of hIgG was performed by monitoring the surface plasmon resonance absorbance ratio of the thrombin-induced fibrin–AuNP aggregates at 650/540 nm. Our sensing system permits the selective detection of hIgG to a concentration of 5 nM. The practicality of this approach has been validated by the determination of the hIgG concentrations in plasma samples.